Hi all. It’s team building time! Just about to kick off a community business partnership. 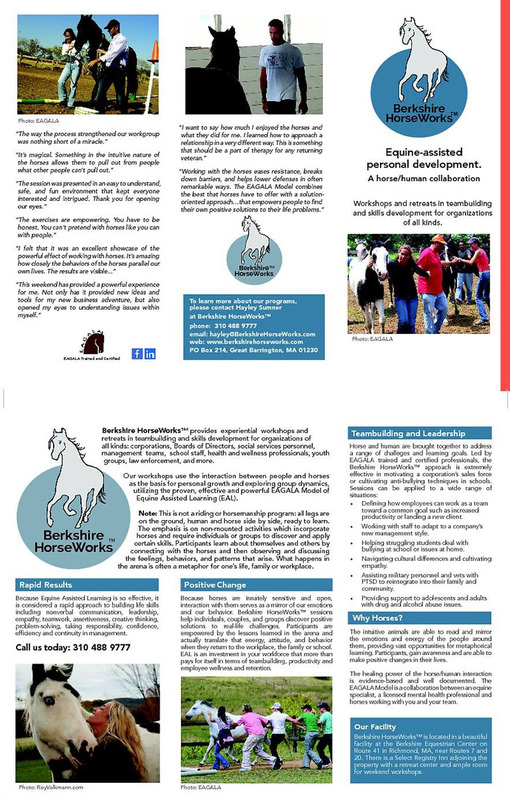 Check out our hot-off-the-press brochure and the benefits of Equine Assisted Learning. 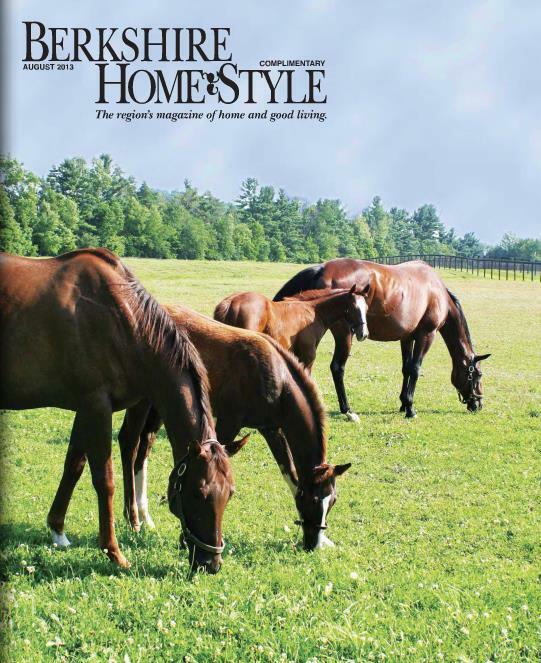 In the August 2013 edition of Berkshire HomeStyle Magazine, a wonderful article was published profiling Berkshire HorseWorks and the EAGALA Model of Equine Assisted Psychotherapy (EAP) and Equine Assisted Learning (EAL) we practice here. Please take a moment to click through to their online magazine and read the article. The article below was published in the Berkshire Eagle and is reprinted here with their permission. Thanks go out to writer Adam Poulisse and the Berkshire Eagle Editorial Staff. Adam Poulisse • Berkshire Eagle • June 24, 2013 – RICHMOND: Buddy, Herman and 007 know how to help people work through their issues, from addiction to coping with tragedy. They are keenly aware of others’ feelings, and will never utter a judgment. Their presence alone can put a grin on your face – especially when they start nudging you or try to munch on your notebook. By the way, Buddy, Herman and 007 are full- grown horses at Berkshire Equestrian Center on Perry’s Peak Road. 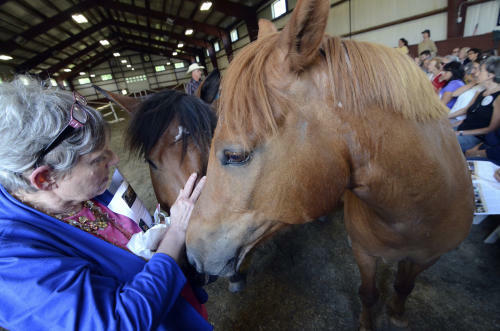 On Thursday, about 50 mental health specialists and horse experts gathered inside a shaded arena at the center to watch as the three horses led volunteers through a demonstration and open house of what can be expected in the upcoming Berkshire HorseWorks. 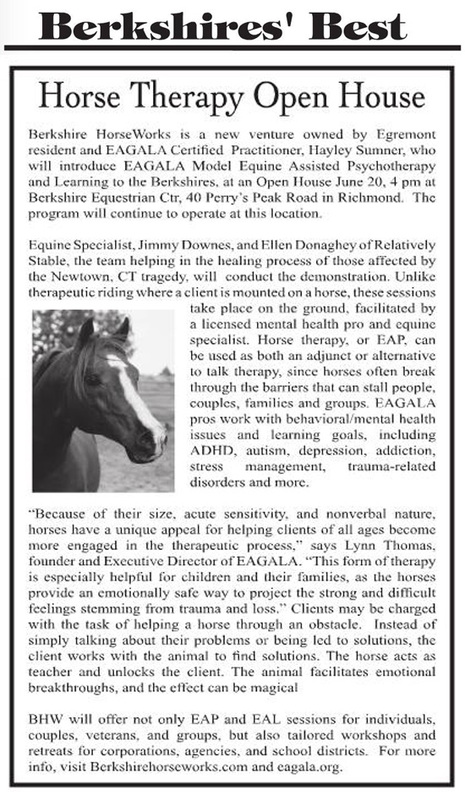 Created just six weeks ago, Berkshire HorseWorks will implement the Equine Assisted Growth and Learning Association (EAGALA) model to treat mental and behavioral challenges, including post-traumatic stress disorder, trauma, eating disorders and anxiety. The EAGALA model uses equine-assisted psychotherapy and equine- assisted learning to help many different patients, from veterans returning from service, to children bullying others in schools. Hulahoops, pool noodles, traffic cones and buckets are just some of the props that can be used along with the horses. It was established in the Southwest in 1989. Thursday’s demonstration was, held, in part, to catch the attention of mental health professionals in the Berkshires and to certify them in the EAGALA model to do work for Berkshire HorseWorks. Berkshire HorseWorks will operate out of Berkshire Equestrian Center. “I see this kind of program as a way of really forwarding individuals and forwarding groups and providing insight,” said Carl Dunham, the owner of Berkshire Equestrian Center. Unlike other horse therapy, the clients never saddle up and ride the horses. Instead, their two feet – and the horse’s four hooves – stay firmly planted on the ground. Horses at Downes’ stable helped families and friends of some of the victims cope with their grief and emotions using the EAGALA model. Downes and Ellen Donaghey of Brewster, N.Y. are two of the four EAGALA models trained at Relatively Stable. Downes and Donaghey led groups of volunteers in three demonstrations of the several Berkshire HorseWorks activities specialized to help a patient work through their trauma. Dominick Sacco, a therapist at Monument Valley Middle School in Richmond, participated in one of the demonstrations: He was one of four linked together that had to act as one human body to get a horse over a small hurdle. Sacco uses dog therapy with his students, but after Thursday, he hopes to use the EAGALA model in the future. Adam Poulisse’s article is also available at BerkshireEagle.com.